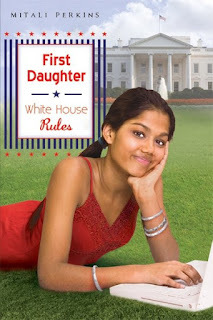 First Daughter: EXTREME AMERICAN MAKEOVER and First Daughter: WHITE HOUSE RULES: In book one about Sameera (Sparrow) Righton, she helps her dad win the presidential election. Readers continue to enjoy Sparrow's witty, one-of-a kind take on life at 1600 Pennyslvania Avenue in FIRST DAUGHTER: WHITE HOUSE RULES. These smart, funny, and timely novels provide an engaging behind-the-scenes glimpse into American politics (firstdaughterbooks.com). Mitali Perkins, author of MONSOON SUMMER and RICKSHAW GIRL, was born in Kolkata, India and immigrated at age seven to the States with her family. She studied political science at Stanford and public policy at Berkeley before deciding to try and change the world one children's book at a time. Her blog (mitaliblog.com) is a virtual fire escape where she chats about books, movies, music, television, and life between cultures. Sparrow, the protagonist of the FIRST DAUGHTER novels, also blogs, keeping track of the hype about the real First Kid wannabes.